"In Champions of the Rosary, Fr. Calloway has written what is probably the most comprehensive book ever written on the rosary. The author deftly negotiates the complexities of the story of the rosary, weaving the historical, theological, and devotional strands into a veritable masterpiece of scholarship and piety. 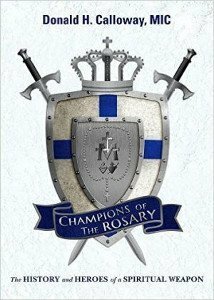 This book should turn every one of its readers into a champion of the rosary." Archbishop Augustine Di Noia, OP, Assistant Secretary, Congregation for the Doctrine of the Faith (Vatican City) 428 pp. Paperback.